I am often asked by my bridal clients for recommendations for venues for bridal preparations, indoor pictures in the event of inclement weather and for lodging for their out of town guests. In the case of this bride and groom the answer was a no-brainer. I sent them to The Melville Marriott, located right off the Long Island Expressway at Route 110 in Melville, New York. This fabulous hotel has it all: a huge bridal suite where the bride and all of her bridesmaids could get ready for the big day ahead. Hundreds of luxurious hotel rooms to house their out of town wedding guests (Be sure to ask any hotel for a multiple room discount. Hotels are more than agreeable to discounting their rates when they know they’re going to fill a block of rooms on one reservation). Finally, their beautiful tropical-like atrium lobby offers a wonderful backdrop for photographs...something that came in very handy on this wedding day because, unfortunately, this bride and groom had terribly bad weather on their wedding day.This hotel features three adjacent glass elevators that rise to the guest room floors. I knew they would provide for an exceptional photo opportunity for my clients. Even if you don’t have perfect weather on your wedding day your photographer should be creative enough and talented enough to provide you with dramatic, exciting pictures. In this scenario my assistant took the bride and groom into the elevator, draped the bride’s dress and cathedral length gown out elegantly in the small space and lit them from behind with a radio-controlled flash unit that I could fire from my camera position on the ground floor of the hotel lobby. 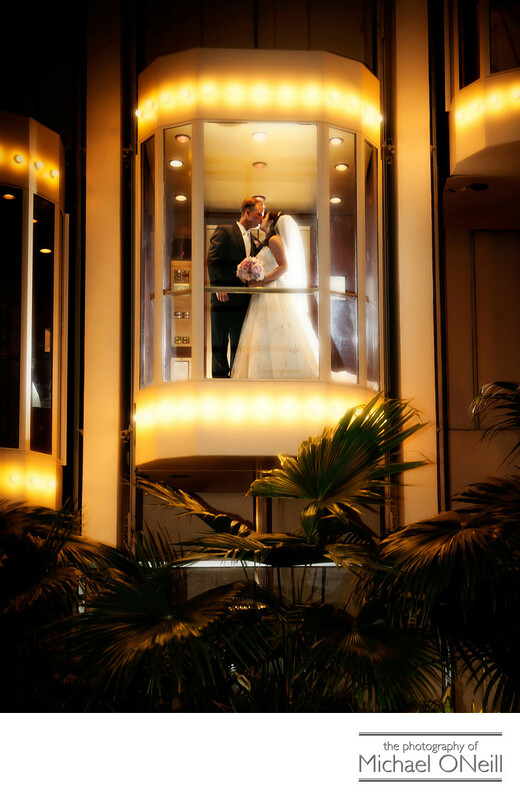 The couple engaged in a long kiss as the elevator rose and when the car reached the perfect height I released the shutter on my camera to capture this image.I offer this story as advice for anyone shopping for an outstanding wedding photographer. I have been pursuing this endeavor for more than thirty years and have witnessed every possible weather scenario that you can imagine. Almost any competent photographer can take a reasonably good picture on an overcast day, but it takes a truly accomplished photographic artist to make the magic happen under adverse conditions. When interviewing photographers for your wedding don’t just let them show you their best work, created on the best of days. Ask to see some work that was produced under less than ideal weather conditions. A masterful photographer can make the magic happen anywhere...anytime. I wish you nothing but the best on your wedding day, but am prepared if Mother Nature doesn’t cooperate. I would love to share my images and my insight with you. Give me a shout and we’ll get together to discuss your plans (Plan A and Plan B) for your wedding day.